Vrindavan, June 2, 2014: The Brajwasis and saints from Vrindavan signed a petition to be sent to the Prime Minister Narendra Modi and many other parliamentarians in a bid to protect the cows from slaughtering. The meeting was organized at Jai Singh Ghera where prominent Acharyas were present. The meeting was presided by His Holiness Acharya Shrivatsa Goswami ji Maharaj. The petition was signed under the banner of Gauvansh Raksha Mission, Vrindavan. It demanded complete ban of slaughtering on the Gau-vans (cow family), which includes the cows, bulls, oxen and the calves. Severe punishment similar to the life imprisonment should be awarded who are caught slaughtering the cows. A cow protection department should be opened in every district. The letter demands if it is needed a separate ministry should be formed which will not only stop the cow slaughtering, but help provide the basic requirements for the cows. A pasture land should be acquired in every village for the cow grazing. The trade and handling of the cows should be regulated, and permission to buy and sale of the cow should be made mandatory from the government. Those who keep the cows should be made responsible to provide the basic facilities for the cows, so that they don’t suffer in heat, rain and cold. A special status of National wealth should be given for the cows, so that no one can harm them. Shri Damodar Shashtri, the National President of the newly formed Gauvansh Raksha Mission said that online petition will be made to be signed by all the cow devotees. He added that a team from the mission will meet the Prime Minister and the RSS chief once the appointment is gotten. They will be briefed on the plight of the cows here in Vraja. All the stake holders on the cow protection are being contacted to make the movement bigger. The printed stickers and fliers were also released to bring awareness on the plight of the cows. The meeting was graced by Mahamandaleshwar Swmai Manohar Das Baba, Shri Sacchidananda Dwivedi, Acharya Chandra Prakash Sharma, Pt. Ram Narayan Brajwasi, Swami Sushilananda, Anshuman Gopal ji, Pt. Damodar Shashtri, Madhumangal Shukla, Jagannath Poddar. 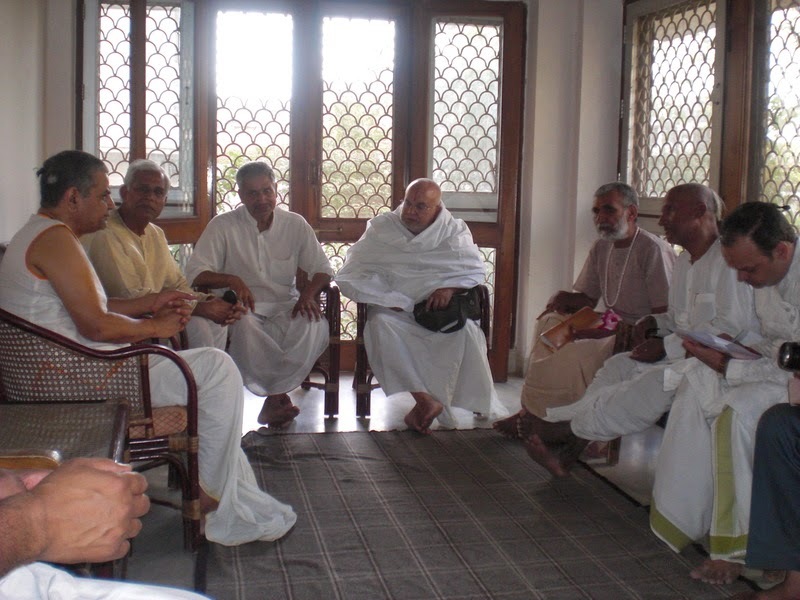 The meeting was organized in coordination with Friends of Vrindavan.